“Would You Kindly” Take A Look At These New Bioshock POP! Figures? Leave a Comment on “Would You Kindly” Take A Look At These New Bioshock POP! Figures? Characters from the critically acclaimed and widely popular BioShock series are the latest addition to POP! Games! Booker DeWitt, former member of the Pinkerton National Detective Agency, comes with either his signature firearm or Sky-Hook for a quick escape! Nothing will keep Booker from the task at hand: rescuing Elizabeth! And from the first Bioshock, take a trip beyond the sea with the Little Sister and super-sized 6” Big Daddy POP! 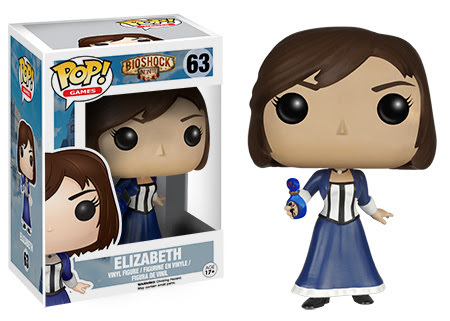 All four of these Bioshock and Bioshock Infinite POP! 3 3/4 vinyl figures (and, of course, the super-sized 6″ Big Daddy figure) are hitting stores this September– so keep an eye out for them and more at your local GameStop, Toys R Us, comic shop, and wherever toys and collectibles are sold! Next Entry New Spider-Man Series “Spidey” Releasing in 2015!